For Doers... 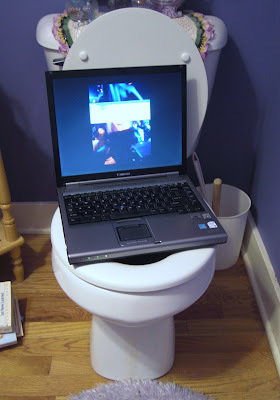 Innovation Culture for Delighting Customers: My computer has to go to the bathroom... AGAIN. Ok, we’ve all been there. Spicy nachos, hot wings, melon, bad apple pie, summer warmed potato salad, 4 day sushi, etc. Pick your poison. Chances are something on this list has made you ill at some point, forcing you to hunker down over the porcelain in one way or the other. But here is what I don’t understand. Why is my computer getting sick? I don’t think that I’m feeding it bad food. I treat its systems kindly. My IT group automatically and periodically pushes all sanctioned updates to my computer. And, according to my enterprise anti-virus software my computer doesn’t have any tape worms or parasites. So why it is today after using my computer for a few days without turning it off I have to shut it down and start anew. I am not receiving a message to do this but as a savvy computer user with a few battle scars I realize that the reboot will purge the pipes and gets things flowing smoothly again. Here is my real angst with this scenario that happens way too often. At this moment, spread across two monitors, I have the following open on my computer. I think this is typically of high capacity professionals that really do use their computers as the productivity and communication vehicles they purport to be. Why must I close all of these items? Why is this acceptable? This really is a horrible customer experience. Imagine a construction site that has to be rebooted during different phases of construction. What a ridiculous thought. Want to change the channel on your television. Well sucker, we’re sorry. You’ve had your TV on for several hours and you have surfed over 100 channels. It is now time to reboot your TV. Never mind that your show is about to start. Again this would be ridiculous. Why would we stand for this? I invite software and computer architects like Ray Ozzie, of Microsoft or others to comment on the state of the “instant on” and “always on” personal or business computer. If this exists somewhere, and some knowledgeable reader knows something I don’t, by all means please pass the bread. Here are 3 simple design principles to consider when designing future computing experiences. Stop starting everything at one time upon boot up. Ease into it. Give me choices. Learn from what I have been doing recently. I don’t give a damn that some program added itself to the start menu and now appears as an icon in my system tray. If I haven’t used that program for months or years, don’t waste my valuable computing cycles starting it up. Boot up time is TOO long. Learn from TiVo. They do a decent job. Better yet, learn from humans just waking. They ease into the morning and their day. Learn from nature. Adult human beings take care of system needs by going to the bathroom periodically. They tend to do this at times convenient to them and in proximity to proper facilities. If my computer is sitting idle because I am getting an espresso (this is really about to happen), then that might be a good time for a mini computer bathroom break. Think of it as potty training for computers. If you are going to take my system down directly go a step further than allowing me to restore the open office applications that you crashed. How about the 20 mails I was going to respond to that I culled from the list of thousand of mails over the course of the last several days all residing in my inbox. Its simply is too painful to resurrect the path of finding these emails. This means lost opportunity and more angst. How about preserving my desktop and all of its applications and files much the same as if I walked away from a project in my kitchen, garden, or garage. When I return, voilla, it is still there just the way I left it. No missing spatulas, misplaced fountains, or electrical outlets void of power. If you have to send my computer to the bathroom, don’t hide my stuff and make me look for it upon return. If you don’t restore order for me, at least make me a useable map. As a human, I remember stuff. You’re a computer, you should too. Sure, I can imagine how insanely complex a computer is under the hood. Picturing WW3 under the keyboard of my laptop is probably close. Perhaps it's more like the floor at the NYSE. Organized chaos. Trouble is, customers don't care. If it doesn't just work, they will abandon it. Think about all the products we use daily, and imagine life if they were as unpredictable as your computer. My refrigerator decides, "Hey, I'm bored with keeping things cold. I'm going to heat things up around here." And where in the world does the computer go when the hard drive light flickers wildly, and the screen stops listening to me for some period of time. I mean, really, must you do that right now? Is it so important that I need to take a coffee break while you do... whatever it is you're doing? So why can't you tell me what you're doing, and ask permission? Can't you tell that I'm busy here, trying desparately to get something done? Users need to be unencumbered by what's going on under the hood. When I press on the gas, for gosh sakes, go! Not, "Well, just a minute. I need to finish this little scan I have going on. A pet project really, but I do enjoy it, so you'll just need to sit tight until I'm ready to relinquish control." I don't EVER want my computer to keep me waiting.